The four Cs form the bedrock of all pedagogical practices of the Junior Section and inspire the teaching and learning processes of the primary section. The ’creative spirit’ and camaraderie eulogised by Rabindranath Tagore and advocated by The National Curriculum Framework (NCF 2005) is amply provided scope in role-play and project based learning, theme based activities and above all an integrated approach that is adopted in the school to ensure that physical, social, emotional, cultural and moral development of the child go hand in hand with the scholastic development of the child. Technology aided learning, team building, leadership training, are some of the important 21st century learning skills that are nurtured from a very early age. Independent thinking is promoted through group discussions which encourages self-learning and ensures the development of higher order thinking skills. 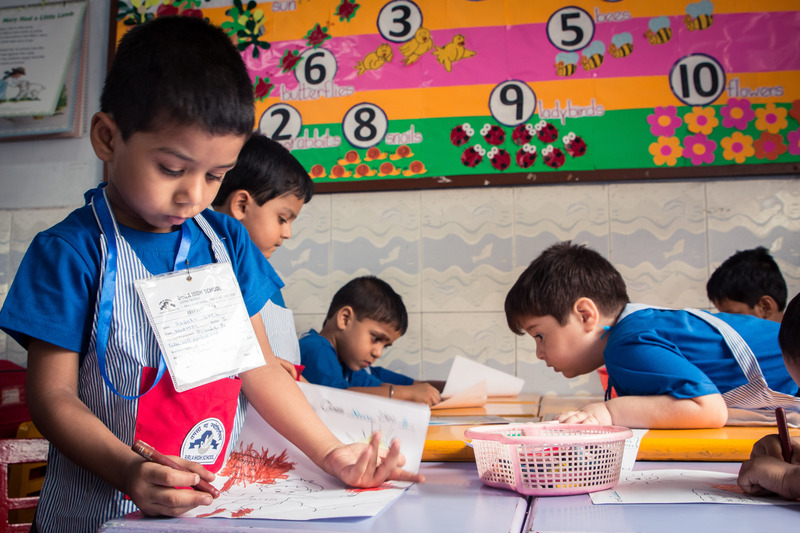 The curriculum is based along the guidelines provided by NCERT and the National Curriculum Framework 2005 ( NCF 2005)and is regularly reviewed and updated by a dedicated team of teachers. The school follows comprehensive continuous evaluation system which measures concept rather than content development. Application of concepts learnt, field trips, out- reach programmes help in the development of life skills.